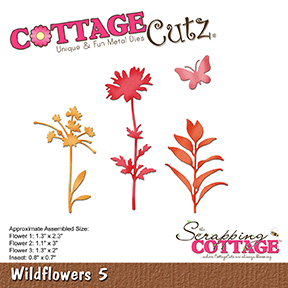 I hope you all are having good fun with the CottageCutz new release dies. They have also come up with new stamp and die combo sets and they are all too good. For my cards today, I am showing two simple yet very pretty cards. Here I have used the negatives of the die cuts as stencils to create a lovely background effect. 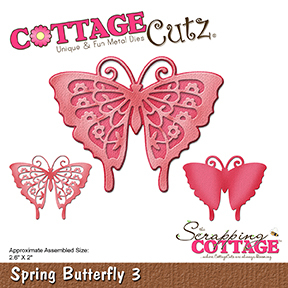 I used the CottageCutz Spring Butterfly 3 to cut two pieces of butterfly. Using the negative of the die cut, create a subtle background using distress ink seedless preserve. Distress the butterflies with Distress inks seedless preserve, picked raspberry and wilted violet.Spritz a little with water. Add the butterfly on to the card base. Add some sequins and glitter. Do follow the pictures to know how I created this card. Cut a white card stock to size 4.5 inches by 5.5 inches. Use. a circle of a negative die cut as mask for the sun. Distress the remaining area with distress inks. Using the negative of the die cut of wild flower, Sponge some shadow effect of the plant. Add the positive die cut.Remove the mask. Do visit the CottageCutz Store to see all the new collection. I hope you liked my work. I will be featuring more of the new release dies so stay tuned. I'm so glad I got to see both cards because I really like the purple butterfly one! Purple is one of my favorite colors.